International Sanctuary has created a highly successful model for aftercare incorporating economic empowerment with personal and professional growth. iSanctuary has been asked to expand the model to address the growing need around the world. As thousands of girls are rescued each year, the need for rehabilitation continues to grow. Since 2007, International Sanctuary has worked to develop a successful aftercare program serving survivors rescued in Mumbai, India; Orange County, California; and Kampala, Uganda. Through experience, International Sanctuary has refined its core program which fills the gap between rescue and restoration. 2020 Vision: To launch 10 sanctuaries around the world where girls and women rescued from slavery are empowered in the restoration of their mind, body, and soul. Trafficking organizations around the world have asked International Sanctuary to provide its successful program to survivors in locations such as Mexico, Cambodia, and the Philippines. The first steps to our long term strategy are solidifying our infrastructure, developing the program which incorporates an academy, and raising up leaders to support this network of reintegration. The initial phase of our program is providing jobs to survivors of trafficking through our jewelry brand: Purpose. Economic empowerment is only the beginning. In our trauma-informed workplace communities, survivors form trusting, long-term relationships with a workshop manager/coach/mother and others who have been rescued from trafficking. It’s in these communities that girls and women are able to be emotionally vulnerable, grow to gain healing, confidence, and independence, while achieving International Sanctuary's motto of becoming "Stronger, Wiser Women." Employment results in survivors committing to International Sanctuary’s program over a long period where we also provide medical care, housing assistance, education, and personal development. 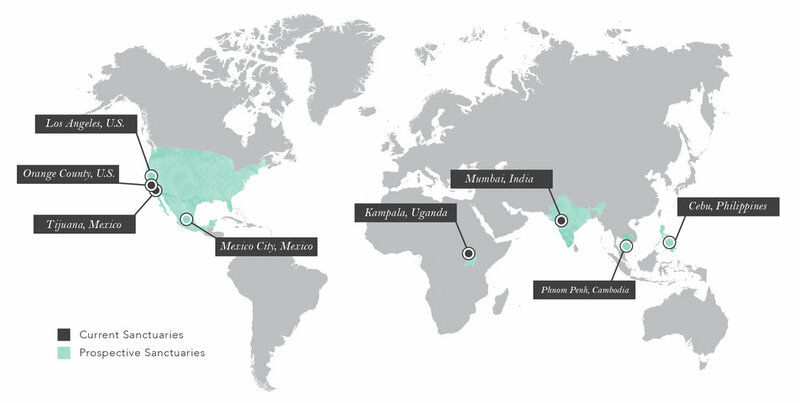 By 2020, International Sanctuary envisions operating 10 sanctuaries around the world that empower hundreds of girls and women rescued from trafficking. We desire to see rescued individuals become "Stronger, Wiser Women." possible. Help us open 10 new sanctuaries around the world.